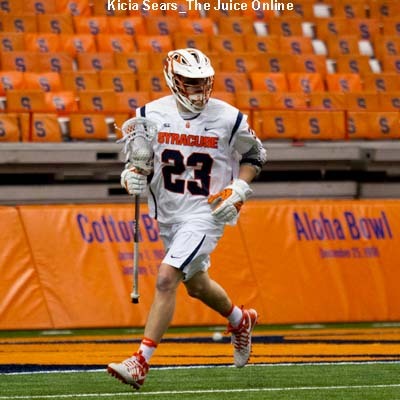 WHO’S OUT: Syracuse has plenty of offensive firepower to replace after losing three out of its top four scorers, and two seniors who were in the starting lineup to begin the season. Tyler Lydon: Syracuse’s second leading scorer (13.2 ppg) and leading rebounder (8.6 rpg) announced he was forgoing his final two years of eligibility and entering the NBA Draft. Offensively, Lydon never lived up to his potential, too frequently deferring to his teammates. But the NBA values stretch 4s that can rebound well. Andrew White: Syracuse’s leading scorer (18.5) was SU’s most reliable offensive option throughout the entire season, though he struggled figuring out the 2-3 defense. 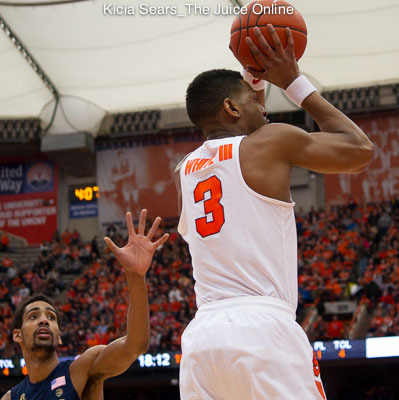 Without White, Syracuse may not have even been an NIT worthy team. John Gillon: The mercurial guard delivered two of SU’s most important wins: A road win against NC State where he topped 40 points, and then a buzzer beating 3-pointer to defeat top-10 opponent Duke at the Carrier Dome. Then again, Gillon also struggled in SU’s two NIT games. He ended up being SU’s leading assist man at 5.4 helpers per game. Tyler Roberson: Roberson found himself in and out (mostly in) Jim Boeheim’s doghouse through most of the season. Tall and athletic, Roberson seemed like a perfect fit for the zone, but could never get his offense going in four years. Dajuan Coleman: Oh what could have been. Coleman arrived at Syracuse as a McDonald’s High School All-American with a polished inside game for a freshman. But two knee surgeries forced Coleman to be a bit player at the end of his career. Howard Washington: While not the most splashy commit, Washington could potentially fill a void at backup point guard next season behind Frank Howard. The former Butler commit had been pining for a Syracuse offer for quite some time, and only needed days after receiving one to pull the trigger. Oshae Brissett: The spindly Brissett fits the classic wing build of a Syracuse recruit at 6’6″ and 195 pounds. Much of Brissett’s playing time will depend on whether Syracuse adds a graduate transfer like it did last season with White, and how much Matt Moyer developed in the offseason. Bourama Sidibe: Don’t expect much from the 6-10, 225 pound commit in his first year, especially since he’s buried in the depth chart behind Taurean Thompson and Paschal Chukwu. But Sidibe has plenty of upside and can be a contributor later in his SU career. Syracuse’s recruiting class is likely far from being done. Currently, the Orange is recruiting guards Eric Ayala and Chris Duarte, and wings Jordan Tucker and Isaiah Stewart. Ayala and Stewart are in the class of 2018, and there has been some talk about them reclassifying, but they have not made anything official yet. As for Tucker, he was committed to Indiana until the Hoosiers fired Tom Crean, and now the Orange is competing with Villanova, Oregon and Georgia Tech for his services. Gerry McNamara and Jim Boeheim recently flew down to Georgia to visit Tucker, and the Orange could use some scoring punch at wing now that Lydon is moving on to the NBA. Duarte visited Syracuse earlier in the season, but still doesn’t have an offer. Syracuse could also get involved with Tremont Waters, currently committed to Georgetown. The four-star point guard isn’t the classic Syracuse recruit at just 5-11, 165, but Syracuse is in need of a star floor general in its class after losing Quade Green to Kentucky. Then again, the Orange may not get that chance since Georgetown has not released Waters yet following the dismissal of John Thompson III. The Orange will almost certainly explore the graduate transfer market, as well, given the successes they had with Gillon and White. Tyus Battle: Battle figures to be the alpha dog on the 2017-18 team. As the ACC season wore on, Battle was one of SU’s most consistent scorers, recording double digits in his last seven games. It’s not likely that Battle sticks around Syracuse after his sophomore season, so enjoy watching him while he’s still here. 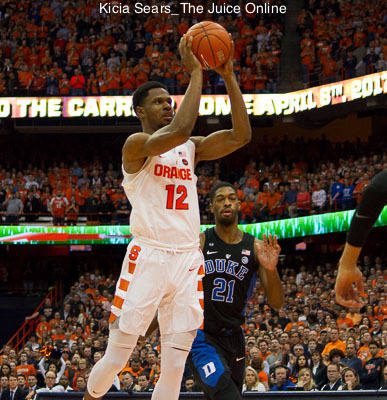 Taurean Thompson: Thompson joined the SU starting lineup once ACC play started, and showed an impressive offensive repertoire. While he’s still incredibly raw on the defensive end, Thompson should combine with Battle to form an effective 1-2 offensive punch next season. Franklin Howard: Howard’s confidence took a nosedive in his sophomore season, and was mostly out of the rotation in conference play. Boeheim during his post-season press conference alluded to Howard making a “Scoop Jardine” like jump in his junior year. Paschal Chukwu: The 7-2 big man only appeared in seven games, and was forced out of the rest of the season after having surgery for a detached retina. Chukwu certainly has the size to be effective in the zone, but still appeared not to grasp the nuances of the zone in the limited minutes he played last season. EARLY MVP: As mentioned above, the job of go-to scorer will be Battle’s role next season. He was third on the team at 11.3 points per game, and will absorb the shots that White and Gillon took. EARLY MIP: Last year at this time, I put in my vote for Frank Howard in this spot. I will again put him here after hearing Boeheim say that SU is going to work on Howard’s confidence in the offseason. EARLY DARK HORSE: While Battle is the logical choice for SU’s leading scorer next season, how about Thompson? With a feathery touch from outside and a deft set of moves inside, Thompson has all of the tools to be one of the most productive big men in the ACC. How will Mike Hopkins departure to Washington affect the team? Certainly, Hopkins was a great recruiter, but he was also the ‘Good Cop’ to Boeheim’s ‘Bad Cop’ in the locker room. On that note, who will be Syracuse’s next assistant coach? Does Boeheim go with an excellent recruiter, or someone more involved with player development? And will that next assistant coach have ties to the SU program? How good will Chukwu be? If he can be productive, Syracuse’s interior defense and rebounding — two weaknesses this season — will improve. Who will replace White and Lydon’s production? Battle and Thompson and certainly help fill the void, but Syracuse will need more than the two of them scoring to be successful. Will Syracuse land other players? Syracuse needs a wing that can score. Tucker would help a lot, but SU can also test the waters again with a graduate transfer.